Research is an integral part of a university, and whether you’re taking undergraduate courses or in graduate studies, Laurier has many opportunities to take part in research-based experiences. Are there changes you want to see in the world? Do you want to make a difference in a real-world issue? Research is action. Research is what informs policy and decision-making at the highest levels. There are research opportunities in any field you are interested in and passionate about. Research is the best way to become an expert in the newest developments in your field. Your perspective is valued and needed. The more diversity of approaches to address a problem, the better you can make society. 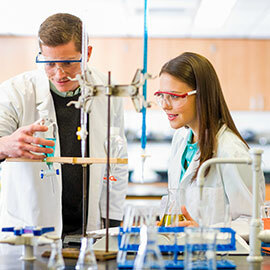 Laurier has world-class researchers who are able to mentor and guide your research project. You can travel to some of the world’s most remote and unique locations. Laurier faculty members have research sites in far-away places from Canada’s Arctic to Jordan’s desert. Students also have opportunities to travel around the world presenting their research at conferences. Participating in research will train you how to use the latest equipment, technology or techniques required in your field. Whether it’s taking samples, conducting interviews or working closely with clients, these skills will help to bolster your resume. By participating in research opportunities, especially at the graduate level, you have the chance to teach and mentor students to become passionate about your field. Research isn’t just about writing peer-reviewed papers in prestigious journals. Many Laurier students present their research through art exhibits, video and photography to make their research accessible to others. There are also several annual contests that provide financial awards for creative ways of sharing research. Research makes classroom learning real. Learning how to write and conduct research can transform how you view your education because you get to apply what you learn. The best way to establish important connections and relationships that will help you in your career is by being in the field, participating in hands-on research and presenting your research at conferences. Many Laurier researchers hold grants to hire and train students in their research labs. The major government research funding bodies such as the Natural Sciences and Engineering Research Council (NSERC), the Social Sciences and Humanities Research Council (SSHRC) and the Canadian Institutes of Health Research (CIHR), provide grants and awards to students for their research projects that not only help financially, but also help you build prestige in your field.